Nathan S. from Lenexa, KS signed. This is the best way to put money back into the pockets of hard working United States citizens and still ensure that our country has the means nessesary to run essential programs. Congress, this is a very real opportunity to benefit Americans in a wonderful, tangible way. It is time for The Fair Tax Act to be passed, to become a reality in our lives. Please pass H.R. 25 and S. 18. The FairTax is the most simple and straightforward tax system we could adopt, that is truly "sweeping tax reform." It eliminates the IRS and income and payroll taxes, so everyone keeps their entire paycheck, while un-taxing working poor U.S. citizens via the prebate and the elimination of regressive flat FICA and Medicare payroll taxes that is withheld from everyone's paycheck. Most importantly, the intrusive IRS and billions in individual and corporate federal and payroll tax compliance costs each year are eliminated and no tax returns are ever needed again. We only pay the federal Fairfax on purchases of new goods and services and this includes everyone, including those in the U.S. illegally or operating criminal enterprises- since everyone who lives here has to consume goods and services to live. These new goods and services will cost significantly less due to embedded income and payroll taxes now being removed from the roll-up of costs that go into the price of every good and service we consume, which offsets to a substantial degree the inclusive FairTax that will now be included in the price of new goods and services. 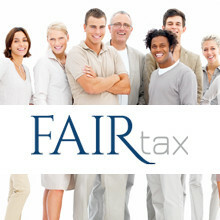 The FairTax encourages "legal" immigration, since a social security number is needed to receive the prebate and will be a great step in becoming more environmentally friendly as a nation, since the paper printed out each year to comply with 77,000 pages of IRS rules, regulations and tax court opinions and rulings could stretch around the earth thousands of times, and the FairTax will encourage the purchase of many more "used" items since the FairTax is only included in the price of new goods and services. Lastly, a significant portion of Washington D.C. lobbyists will be unnecessary since there will be no more special treatment tax exemptions, exclusions or carve-outs to lobby for, and politicians won't be able to use the tax code to divide this great nation along ideological lines any more, since the only political debate will be what the FairTax "rate" should be. Let's get the USA back on a sustainable path. Real tax reform would be a great start. Adam P. from Lawrenceville, GA signed. We can no longer afford a culture of endless consumption and a Political Economy that robs labor and capital of their ability to work and aid each other. Let us not have another generation of indigent people who cannot bargain for their best deal. If this isn't passed, you should be voted out with everyone else. Kristy C. from Jacksonville, FL signed. Someone from Apo, AE signed. Someone from Boiling Springs, NC signed. Save everyone in Congress Time, they no longer have to fight over the tax structure. They look ridiculous and are embarrassing. Save everyone in the USA time on their tax return. Let our country save money and make money. Andrew S. from Augusta, GA signed. Jerry A. from Long Beach, MS signed. Carolyn B. from Maitland, FL signed. Let's bring jobs back to the USA, Fair Tax for all. This makes so much sense and it would reduce the federal work force (if that's what you after) by eliminating the IRS. This also simplifies life for every tax paying citizen in the US. Jim C. from Crossville, TN signed.